Model SW1 can switch between superconducting and normal state using the integrated heater. It can be used in low current superconducting circuits such as pickup loops in SQUID-based magnetometers or SQUID input circuits for various detectors. It is successfully being applied in low field MRI (magneto resonance imaging) applications all over the world. The model SW1 has an Nb-based thin film bifilar switching element with low inductance and an integrated heater. The switching time is as low as few microseconds. The customer can select from two switch versions on every chip. Model SW1 is hermetically sealed inside a glass fiber package. It has solder terminals with normal metal wire bond connections to the heaters and Nb terminals with screws for true superconducting connection to the switching element. 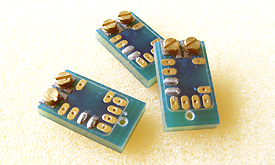 SQUID sensor models CE1blue and CE2blue are available in a compact package combining SQUID sensor and superconducting switch model SW1.